Welcome to the five hundred and fifty-eighth of my blog interviews with novelists, poets, short story authors, biographers, agents, publishers and more. Today’s is with memoirist and non-fiction author Candy Marie Bridges. A list of interviewees (blogged and scheduled) can be found here. If you like what you read, please do go and investigate further. Morgen: Hello, Candy. Please tell us something about yourself, where you’re based, and how you came to be a writer. 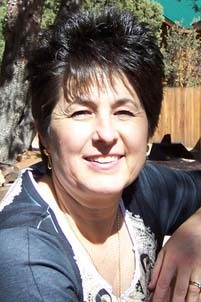 Candy: My name is Candy Marie Bridges and I live and work in the small rural mountain town of Pine, Arizona. Many people have asked me how I ended up here in the mountains of Arizona and what prompted me to renovate a home to create and provide a place of retreat for guests. The abundance of curiosity from our guests and a writer friend of mine challenged me to tell the world my story and so on January 1, 2011, I started writing my memoir. Morgen: Excellent. It sounds a wonderful place (shame I don’t like flying). What have you had published to-date? Candy: Up to now, I have the one book, published as an ebook and also in paperback. Morgen: Isn’t a first book thrilling. Did you have any say in the titles / covers of your books? How important do you think they are? Candy: Yes I was a participant in the title and cover of my book. These choices were very important. My book reflects my life and the title and cover are an important part of the story. Morgen: Of course, more so than fiction. What are you working on at the moment / next? Morgen: I look forward to my ‘who would you invite to dinner’ question. 🙂 Do you do a lot of editing or do you find that as time goes on your writing is more fully-formed? Candy: Editing is a life-long project in itself since our English language can vary so much in meaning and structure. Morgen: It is and we can easily miss things. Do you pitch for submissions and / or are you commissioned to write? Candy: I am learning about this and hope to submit a pitch that will entice those I submit to with the desire to know and learn more about my story. Morgen: You are writing what you know so let’s hope it stays that way. Do you have an agent? Candy: I do not have an agent. I am my own promoter and it is quite a learning experience. I enjoy the social media outlets although they can really consume you with all the opportunities out there right now. Morgen: Can’t they just. Marketing, or the time it takes, is the bug bear for most of the writers I speak to. How much of the marketing do you do for your published works or indeed for yourself as a ‘brand’? Candy: I do most of the marketing by way of social media, a blog and a retail site. I also have book signings and some speaking. Morgen: It must be so rewarding (and I don’t mean financially) meeting your readers in the ‘flesh’. Has anything surprised you about your writing life,? Candy: I guess the time it takes to market and get yourself out into the world. Trying to attract attention goes against my nature, but I know it has to be done. I have to be a squeaky wheel. Morgen: I’m the same. I’m learning to say “hey everyone, I have a novel out!”, although I’m finalising another so am waiting really until they’re both available. What advice would you give aspiring writers? Morgen: Absolutely. We are writers after all. If you could invite three people from any era to dinner, who would you choose and what would you cook (or hide the takeaway containers)? Candy: I love this question. I am assuming you mean all three people would share the meal together with me. Morgen: Thank you, yes it does. Candy: It would be Jesus, my late husband Mike and my best friend, Laleen. I would fix a chicken dish, a pasta dish, and salad. Morgen: Yum. 🙂 Is there a word, phrase or quote you like? Candy: Do unto others as you would have them do unto you. Morgen: Yes, and if you’re good to them you would hope they’d reciprocate. This planet would be a much better place if we were nicer to each other. What point of view do you find most to your liking? Candy: I like writing in the first person. Morgen: Of course, because you’re writing about you. Are you involved in anything else writing-related other than actual writing or marketing of your writing? Candy: Yes. I write for my blog. http://www.CandyMarieBridges.com. I write on other blogs when the topics interest me. Morgen: Ah ha, then you might like to do a writing-related guest blog for me. 🙂 What do you do when you’re not writing? Candy: I run a Christian Retreat House where I also live. http://www.ArizonaChristianRetreat.com. My husband and I host small groups of quilters, scrap bookers, and Christian groups. They come up to retreat and enjoy their friends on retreat with them. In addition, I am a calligraphy artist and picture framer. I have a line of inspirational sayings that are matted and framed. Scriptures and uplifting sentiments for birthdays, Christmas, tough times, weddings, and more. Morgen: What a wonderful life you have. If I could afford to I’d jump at the chance of getting a second property and having writers to stay. 🙂 Are you on any forums or networking sites? If so, how valuable do you find them? Candy: Yes, too many to count. I am a part of some groups on Linked In, Facebook, and Pinterest. Morgen: Me too, and Twitter, RebelMouse, Google+,… as you say, loads. Where can we find out about you and your writing? Candy: You can find my book and more about me at http://www.CandyMarieBridges.com. Morgen: <laughs> You’re very welcome. I’m happy to help expose any writer. 🙂 Is there anything you’d like to ask me? Morgen: You’re very welcome. So glad you could join me today, Candy, thank you. Never in her wildest dreams would Candy Marie Bridges have imagined writing a book. She is not an author by profession nor has she read an impressive number of books during her life. She does though have an uplifting story to tell. And her story is moving readers. Moving them to think about their attitudes and their choice to forgive. The choice to Press On when life is unfair. She wrote her life story because she is asked frequently why she does what she does and how she came to work, serve, and live in the mountains. 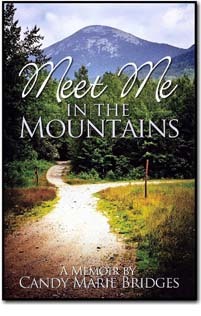 Her inspirational and sometimes edgy memoir, Meet Me In The Mountains, is written with honesty and simplicity. Candy unlocks a past filled with pain, anger, disappointment, joy, faith and hope. She tells all about her parent’s divorce when she was twelve years old and shares about the debilitating autoimmune diseases two of her children still face to this day. She exposes the news of the shocking and heart breaking sudden wrongful death of her husband. She shares what it’s like to be a widow at forty-three years old. She pours her life out with twenty-four thought provoking chapters. They will challenge your own faith, attitude and outlook on life, especially when life throws you unforeseen circumstances. Be prepared to laugh, cry, be angry and rejoice! The reviews and feedback are impressive for Meet Me In The Mountains. When you read a book that makes you think and re think and consider an alternative outlook on your own life and the bumps along the way, it is priceless. Her media page / photos can be found at: http://www.CandyMarieBridges.com.